The last 6 months have been very busy in our Spark Eroding section, we have carried out some very interesting and challenging work, not only our F1 motorsport customers but also in markets like Oil and Gas, Defence, Material testing and University research. Richard (pictured right) and Jack enjoy the challenges that the variety of work we carry out creates. 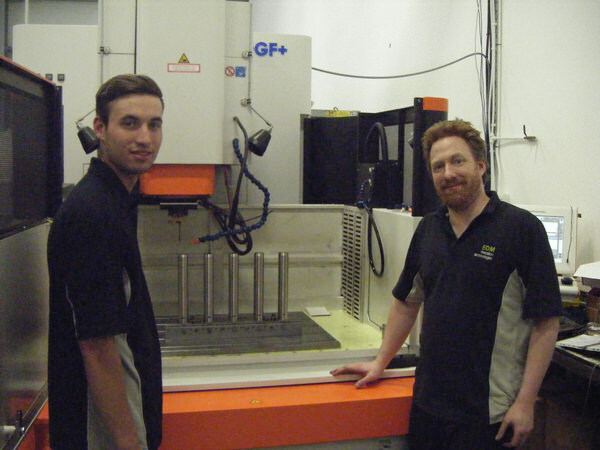 Jack (pictured left) joined us recently after spending the last couple of years as a CNC Miller, making parts for Aston Martin and other manufacturers. He enjoys the environment at EDM, and the opportunity the company provides for him to learn new skills. 2017 has started very well in our Spark Eroding section and with a solid order book even after the very busy F1 build period. We are very positive about what we will achieve this year. It has been a pleasure to deal with you and your team of engineers, on these small, but important components.